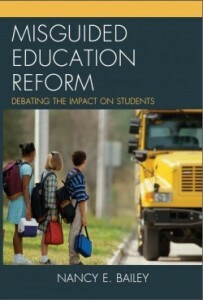 A nice thing that happened to me this past year was the publishing, back in July, of my book, Misguided Education Reform: Debating the Impact on Students, by R & L Books (Rowman & Littlefield). It covers many of the same topics you will find on my blog. I discuss special education which might be the most interesting to many parents and teachers. I cover the changes made with the re-authorizations to Public Law 94-142 and IDEA. I also discuss the problems surrounding testing and Common Core. Many major universities have purchased the book, or made it available on E-book. Having been a college student in education, this has great meaning to me. I can’t count the hours I spent perusing the stacks at college libraries—exploring the ideas of great thinkers and researchers. I hope my book inspires future teachers to stand up for students and do the right things to help them learn. Misguided Education Reform: Debating the Impact on Students is about how today’s reforms impact students and public schools. I provide what I believe would be good solutions. The first chapter covers the nastiness that has become early childhood education and how this age group, in the name of rigor, is being converted into an industrialized working group for the global economy. The second chapter is about testing. Children continue to be treated rottenly when it comes to assessment. I cover how Common Core has stolen a teacher’s creative right to lead in the classroom. The third chapter is about reading. Before Common Core State Standards there was Reading First (RF). I see connections, but even if you don’t, it is worth reviewing the colossal mess that was RF. There is much more information too about reading. The fourth chapter is about the terrible dismantling of special education. This chapter should resonate with anyone concerned about students with disabilities and/or gifted students. I go back to the days of institutions. The fifth chapter is about the harshness of discipline in our schools. Discipline has been used to cast America’s students in a negative light. We must believe in the goodness found in our public school students. 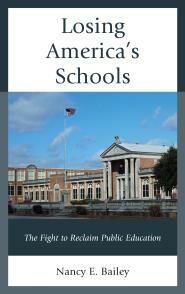 The loss of the arts, what should be a vital area in public schools, is what I explore in the sixth chapter. Losing the arts in our public schools, as well as other subjects, has been a devastating blow to America. The seventh and last chapter covers a topic few mention when it comes to schools. The issues here involve adequate and safe school facilities and how funds to fix school buildings are being diverted to charter schools. Thanks for reading my blog and my book this past year. I always appreciate the wonderfully informed parents and educators who consider my voice. Many of you have strong voices of your own. I listen and applaud your efforts on behalf of America’s students and public schools. I wish you a happy and healthy 2014!